For the hassle of using a VPN or Hola Chrome Extensions this deal is well worth it! As Commander Shepard, rise to become the galaxy’s most elite soldier and lead an all-out war to stop an ancient and ruthless enemy: the Reapers. With over 75 hours of content and more than 300 awards, one of gaming’s most acclaimed franchises is available for the first time in a premium foiled box set. 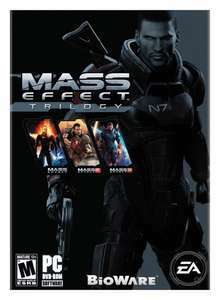 Experience all three Mass Effect games for $59.99. If you're prepared to jump through a couple of hoops, this is an excellent price for the trilogy. Nice find bud, have some heat! If you're prepared to jump through a couple of hoops, this is an … If you're prepared to jump through a couple of hoops, this is an excellent price for the trilogy. Nice find bud, have some heat! Yeh, if only they made this an EU deal they would get a lot of orders. The only difference with this from Amazon is you do run the risk of being banned from Paypal and Gamersgate. Good night out Jay ? What country do I use in Hola? That's still an absolute steal tbh! £4.59 paypal charged me due to their conversion fees. I'm amazed I can get these 3 games for so little. I'd been holding out for a bargain price but didn't expect it to go this low. £39.95 on the gamers gate UK site. Used hola. Code worked on my normal Origin account without problem. Woah what a deal! Super hot! Where is the damn buy button ? Somone get me this if you can I can send the money through paypal as I for cannot figure this VPN crap. £4.59 paypal charged me due to their conversion fees. I'm amazed I can … £4.59 paypal charged me due to their conversion fees. I'm amazed I can get these 3 games for so little. I'd been holding out for a bargain price but didn't expect it to go this low. £39.95 on the gamers gate UK site. Used hola. Code worked on my normal Origin account without problem. did you turn off hola while paying for PayPal? @bonzobananna did you turn off hola while paying for PayPal? No, should I have done? Paypal always charges a non sterling fee and unfortunately I don't have a credit card now without foreign transaction fees. I was using my paypal balance anyway. No, should I have done? Paypal always charges a non sterling fee and … No, should I have done? Paypal always charges a non sterling fee and unfortunately I don't have a credit card now without foreign transaction fees. I was using my paypal balance anyway. If you do not cancel Hola/VPN before entering your details then they are being sent out over an unsecured connection (Password/Usernames can be easily seen). Never enter your details while using a VPN/Proxy. If you do not cancel Hola/VPN before entering your details then they are … If you do not cancel Hola/VPN before entering your details then they are being sent out over an unsecured connection (Password/Usernames can be easily seen). Never enter your details while using a VPN/Proxy. Are you sure that applies to hola? It's just I've only set hola for gamersgate to see me as in the USA? If I put paypal.com or other international sites like panasonic.com they automatically adjust to the UK site in chrome with hola configured. I thought I'd only made an exception for gamersgate. So are you saying hola is making all my browsing insecure? Does paypal still indicate a secure connection despite not being a secure connection? Well my origin collection is growing now. It include 4 games that were free, 1 game that was £1, one that was £1.74 and 3 games that were $4.99 (£3). Now 3 more games added for £4.59 in total. Not exactly a huge investment. About £15 spent. Just realised I actually paid £3.74 for Battlefield 2 complete. Still less than £20 for the lot. Are you sure that applies to hola? It's just I've only set hola for … Are you sure that applies to hola? It's just I've only set hola for gamersgate to see me as in the USA? If I put paypal.com or other international sites like panasonic.com they automatically adjust to the UK site in chrome with hola configured. I thought I'd only made an exception for gamersgate. So are you saying hola is making all my browsing insecure? Does paypal still indicate a secure connection despite not being a secure connection? If Hola is active all your browsing is unsecure. Paypal will still indicate a secure connection. Always deactivate Hola before entering details. Did you mean you just clicked Hola to activate whilst on the gamersgate page ? If so what i said above applies. If Hola is active all your browsing is unsecure. Paypal will still … If Hola is active all your browsing is unsecure. Paypal will still indicate a secure connection. Always deactivate Hola before entering details. Did you mean you just clicked Hola to activate whilst on the gamersgate page ? If so what i said above applies. Oh crap I didn't know this so what do I do now? I have changed my password so what do you think? Oh crap I didn't know this so what do I do now? I have changed my … Oh crap I didn't know this so what do I do now? I have changed my password so what do you think? Are you 100% sure about this because hola has the option to only allow one website you select to be seen as being accessed from another country and I used that feature. Other websites instantly recognise I'm in the UK when using an enabled hola. I just wondered if you are confusing allowing all websites to be accessed as if from the USA and only one site which is what I did? The way I used hola only gamers-gate would have seen me as in the USA all other sites I would still be seen as in the UK. The question I have though is if gamers-gate accesses an external site i.e. paypal is it seen by hola as a different site? I assume it is and would automatically be setup correctly but not sure of this. I'm going to remove it now that I have made my purchase as you've got me a bit worried but I don't see the point of selecting individual sites in hola if it runs the whole browser through a proxy/vpn. One code, but you download them separately so you can only download ME3 if you want (all done through Origin). Are you 100% sure about this because hola has the option to only allow … Are you 100% sure about this because hola has the option to only allow one website you select to be seen as being accessed from another country and I used that feature. Other websites instantly recognise I'm in the UK when using an enabled hola. I just wondered if you are confusing allowing all websites to be accessed as if from the USA and only one site which is what I did?The way I used hola only gamers-gate would have seen me as in the USA all other sites I would still be seen as in the UK. The question I have though is if gamers-gate accesses an external site i.e. paypal is it seen by hola as a different site? I assume it is and would automatically be setup correctly but not sure of this. I'm going to remove it now that I have made my purchase as you've got me a bit worried but I don't see the point of selecting individual sites in hola if it runs the whole browser through a proxy/vpn. I did mean if you ran all sites through Hola. Although i am not too sure about the redirection to Paypal. I would always disconnect a VPN before entering any details. looks like the deal has ended it says $29.99 for me otherwise i would of got it damn. I made an account bought two copies and what you know they banned that account but at least returned my money. So I made another account and this time only ordered one copy and I was successful. This is a complete bargain and I am going to play the heck out of these after my exams are over. I did mean if you ran all sites through Hola. Although i am not too sure … I did mean if you ran all sites through Hola. Although i am not too sure about the redirection to Paypal. I would always disconnect a VPN before entering any details.